100m reel of Powerlink mk.2 compatible (fully wired 8 core) cable. This high quality Powerlink mk.2 compatible cable is supplied WITHOUT plugs fitted! This particular option is aimed for home installations and advanced configurations. See our other Powerlink items if you are looking for fitted plugs. Our high quality Powerlink mk 2 compatible cable allows you to connect Beolab active loudspeakers (all models, either with or without displays) to your Bang and Olufsen hifi system or television. Available in either black or white. ​This cable is perfect for use with older Beolab speakers that have displays (such as Beolab 3000, 4500, 5000 and Penta). For Beolab speakers without a built-in display perhaps our Powerlink mk 3 compatible cable would suit you better. Mk 3 is lower cost, slimmer, lighter and low profile - allowing for much easier cable management! 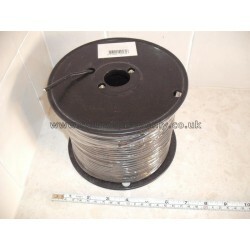 We also sell these cables with fitted plugs in lengths up to 20 metres. AS THIS CABLE REEL WILL BE DELIVERED BY COURIER, PLEASE CAN YOU PROVIDE A CONTACT TELEPHONE NUMBER WHEN YOU PLACE YOUR ORDER. For Beolab speakers without a built-in display perhaps our Powerlink mk 3 compatible cable would suit you better. Mk 3 is lower cost, slimmer, lighter and low profile - allowing for much easier cable management. Please note that we do not have a retail shop or showroom, and so we are unable to accept callers in person at this address.